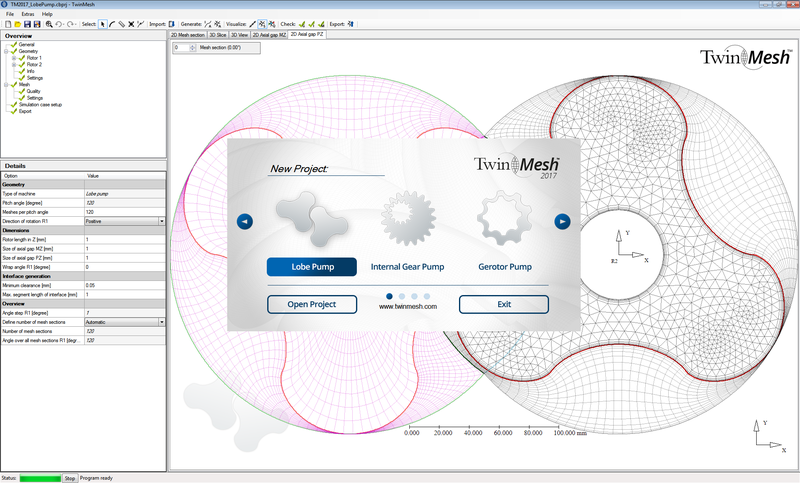 New features of TwinMesh 2017 include vane pumps and orbital motors as new machine types, some machine type extensions such as variable pitch for screw machines and roots blowers, many GUI and function improvements for a more efficient and more intuitive handling, and furthermore, a new unstructured grid generator which can be used for axial gaps where O-grid meshing is not possible, e. g. for scrolls. 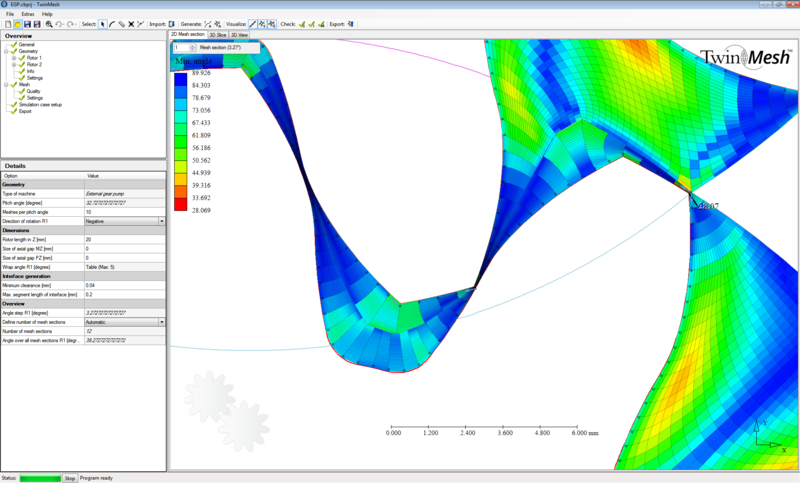 Unbeaten, TwinMesh 2017 is best-in-class when generating high quality hexahedral meshes for reliable and efficient CFD analysis of rotary pd machines. 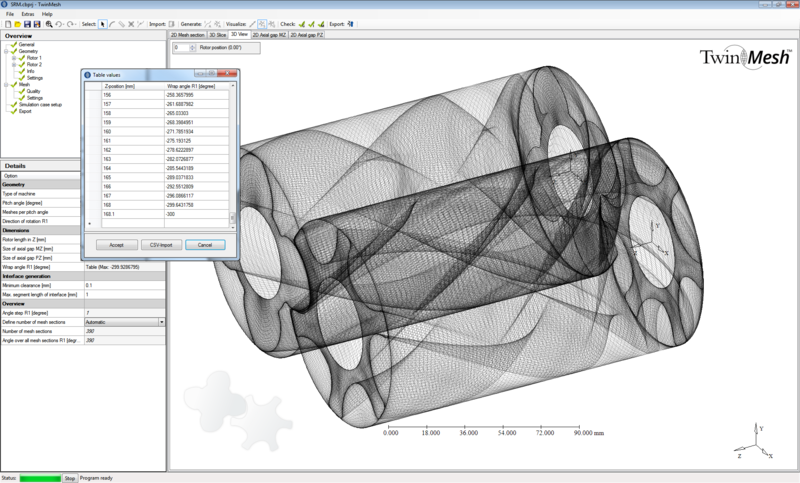 TwinMesh now allows for automatic hexahedral mesh generation for vane pumps, air motors and rolling piston pumps. 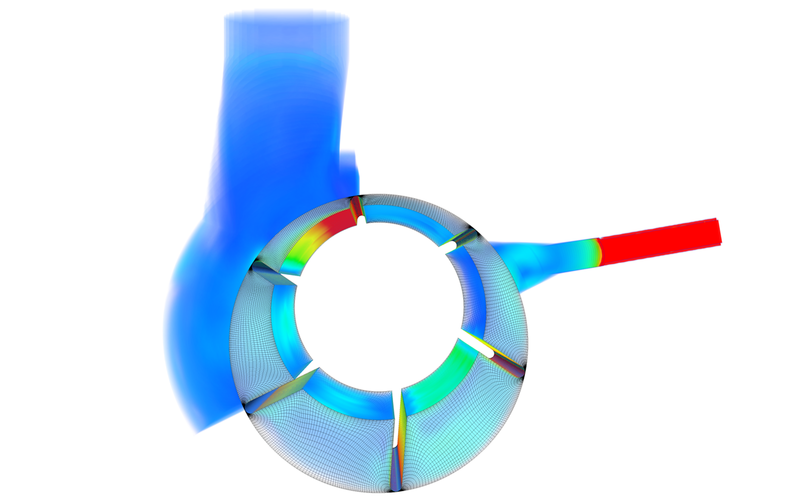 Beside grid generation a template manages automatic simulation setup for ANSYS CFX. 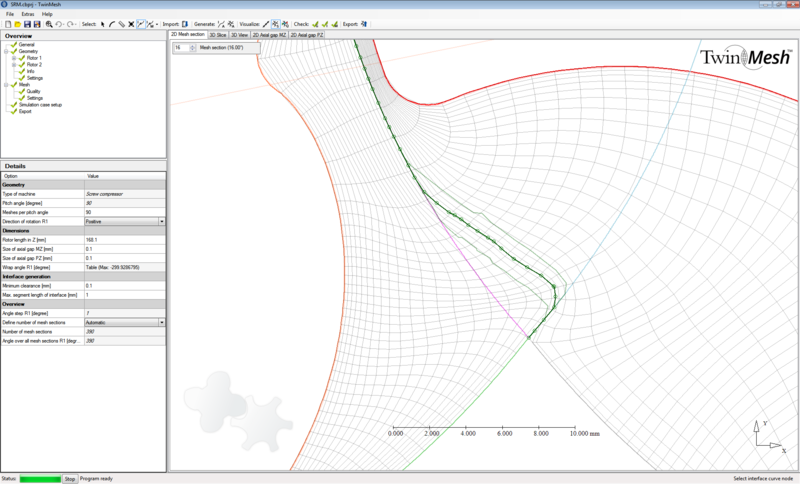 Very nice: the number and shape of the vanes are not limited and TwinMesh supports non-circular casing walls. Also, non-radial translation of the vanes is supported by this new feature. 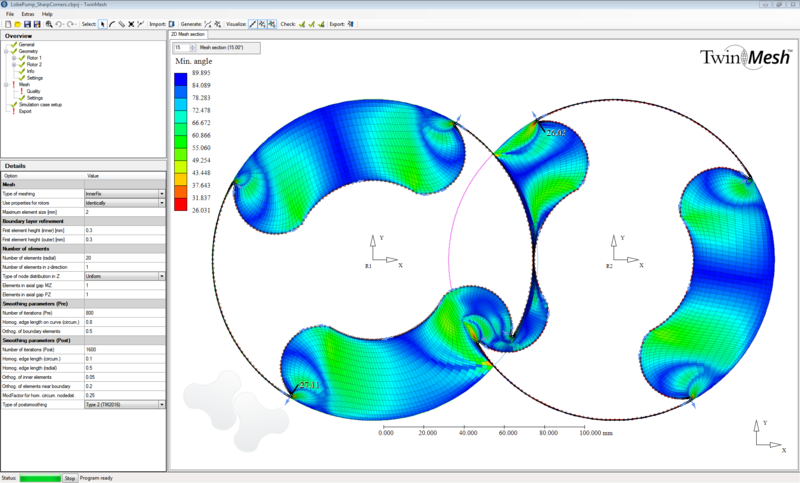 The machine type gerotor pump now allows for mesh generation and simulation setup for orbital motors. In an orbital motor the internal part of the geometry is rotating on an orbital axis while the outer part remains stationary. 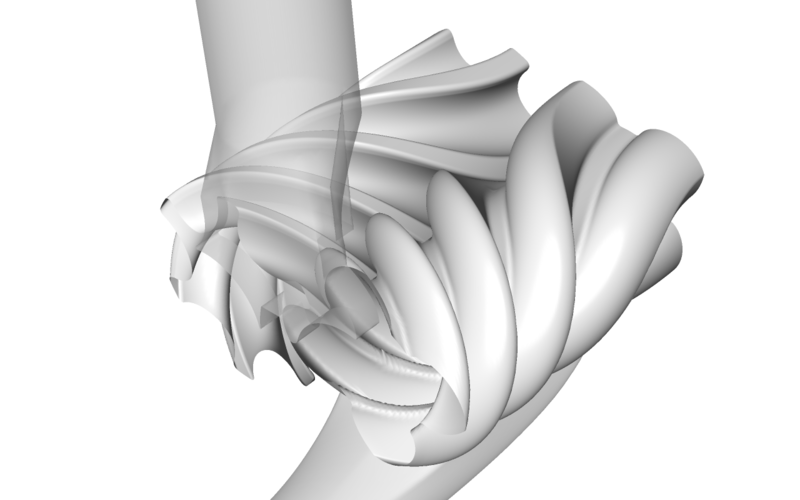 Also, TwinMesh now supports rotary piston pumps as well as claw rotor profiles. 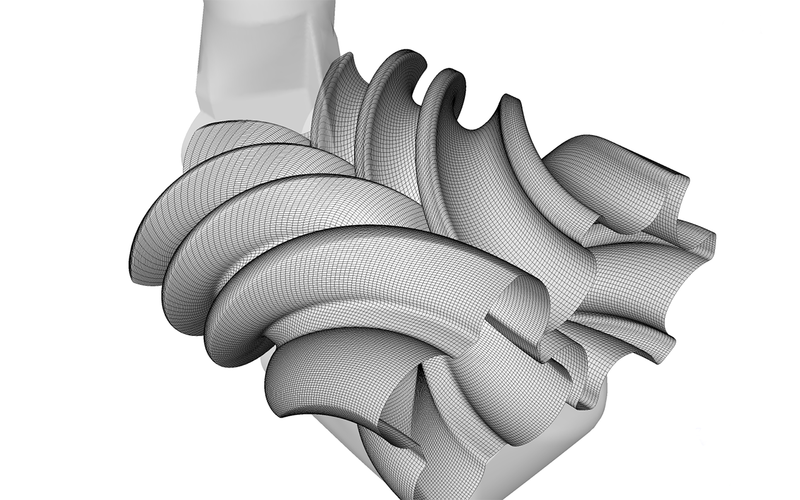 Variable wrap angles and double helical gearing become more interesting for engineers as manufacturing facilities progress. For screw machines, lobe pumps, roots blowers, and gear pumps the wrap angle of the rotor can therefore now easily be imported as a 2-column-.csv-file. 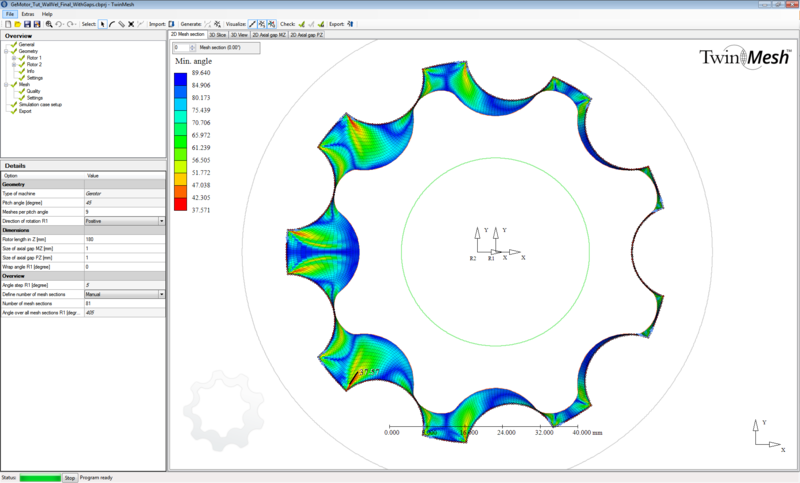 This allows an individual wrap angle for any position in z-direction and ensures that any design can be evaluated using CFD analysis. When conformal interfaces (1to1) between meshes are not possible (InnerFix method) an automatic node mapping can be used to avoid small gaps or overlapping elements at the interface. The automatic node mapping has been further improved to ensure best representation of the geometry as well as maximum quality of the meshes. 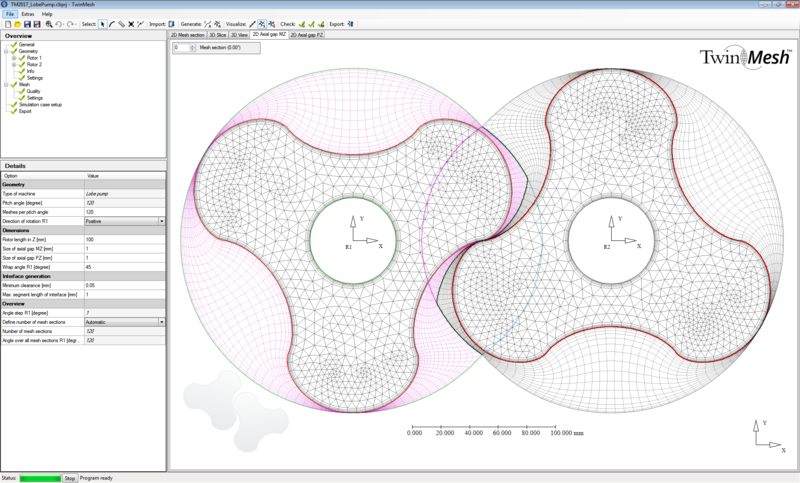 For axial machine gaps TwinMesh generates hexahedral meshes with conformal connection to the rotor meshes. However, sometimes mesh quality can be low due to geometry shape or O-type hexgrids cannot be used. 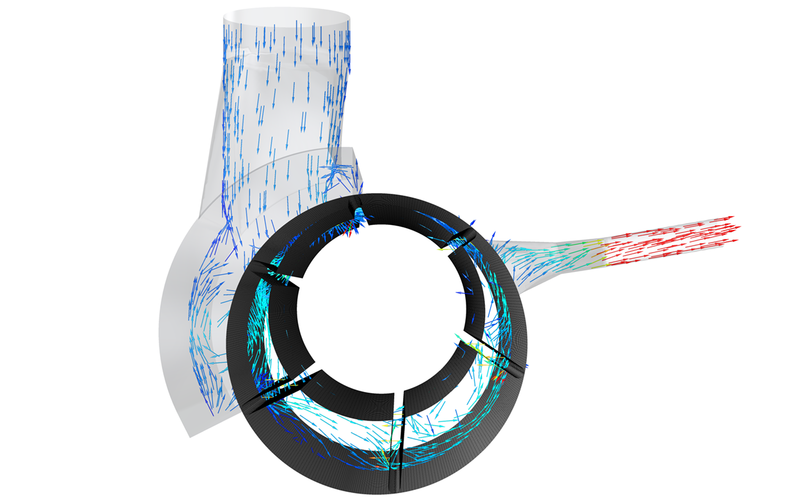 For those cases TwinMesh now offers an unstructured mesh generator which connects with rotor grids using inflation layers. TwinMesh now supports manual interface modification. For those cases where the automatic interface creation does not fit all user requirements the interface can now be modified manually by the user. This helps improving mesh quality e. g. for claw rotor profiles or rotary piston pumps. 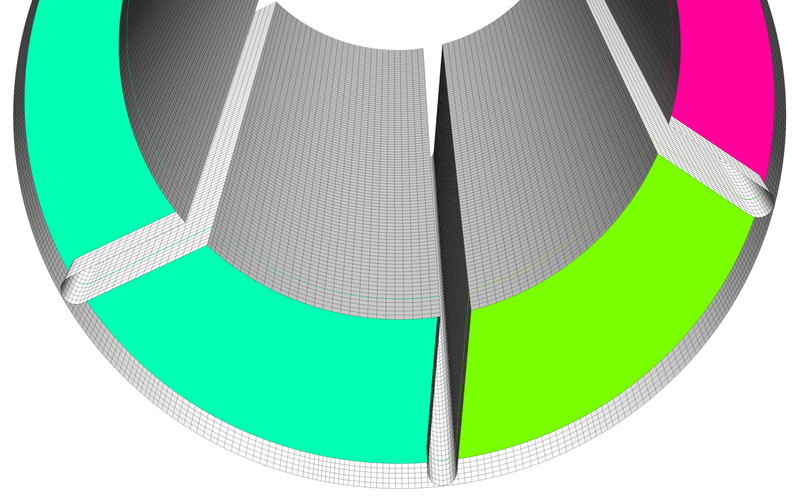 Mesh generation is now possible for user defined intervals of mesh sections. This helps to improve mesh quality and to shorten the overall turnaround time. 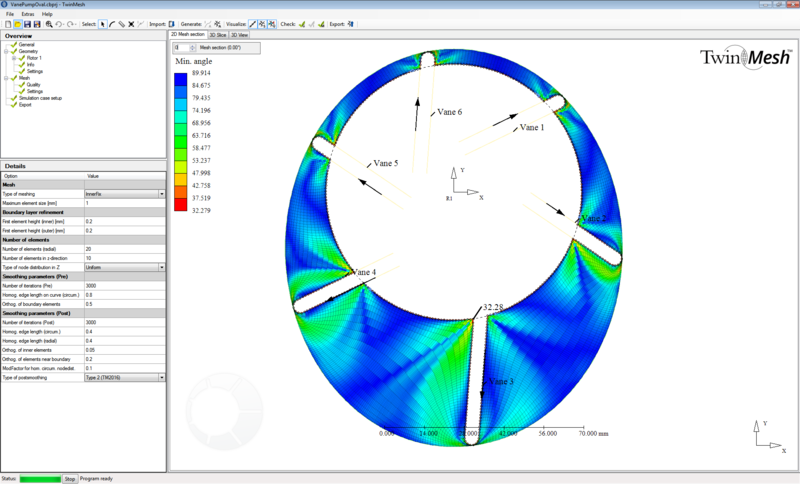 User defined node distribution in axial direction allows now local refinement at specific axial sections. This helps e. g. to refine the mesh and to get a conformal mesh resolution at positions where injection pipes for oil-injection are located. 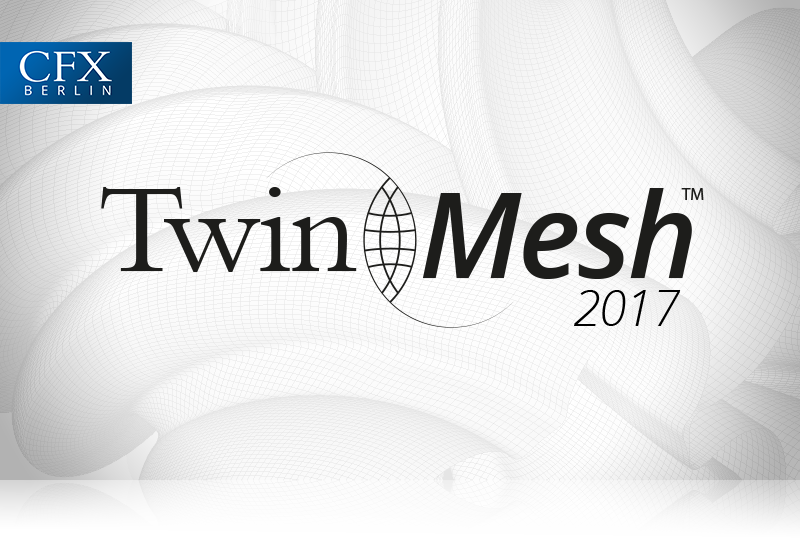 The license mechanism in TwinMesh 2017 was modified in order to support all new machine types. Users of “TwinMesh 2017 Preview” can use their existing license. However, users of TwinMesh 2016 will need a new license file. Enjoy working with this great new release of the industry leading software for structured grid generation for rotary positive displacement machines! In order to get the new version of TwinMesh please contact us or your local TwinMesh reseller.